Rey Mysterio's return at the Royal Rumble match last year garnered one of the loudest pops of the night. The master of the 619 is one of the greatest in-ring performers in the company's history. Mysterio is the biggest Hispanic Superstar (along with the Late Eddie Gurrero) to have ever stepped foot in a WWE ring. Vince McMahon has been looking for the next Rey Mysterio for years, with superstars like Sin Cara and Alberto Del Rio being pushed to fill the void left by Mysterio's departure. But, there is only one Rey Mysterio and the company has failed everytime they have tried to bring in the second coming of Mysterio. Even at the age of 44, he is putting on some fabulous matches ever since returning to the WWE in late 2018. His series of matches against Andrade has earned him praise and adulation from all quarters. But, with that being said, Mysterio's booking hasn't been the best since returning and is something that the creative team needs to work on, given the iconic status that Rey has. It is safe to say that Mysterio is at the fag end of his WWE or perhaps even his wrestling career. From someone who has been doing this for past three decades, Mysterio still is in great shape but with the kind of toil his body has taken over the years, one would think that 2019 would be the swansong year for Mysterio as an active in-ring performer. Therefore, we believe that Rey deserves to be in a big match at WrestleMania 35 and it doesn't get any bigger than the WWE Championship. Daniel Bryan is going to face off against AJ Styles at the Royal Rumble where Bryan is excepted to retain. With the long-rumored Bryan vs Miz match seemingly being put in the backburner, there aren't many credible opponents for Bryan to face at The Grandest Stage. Mysterio vs Bryan is a dream match that fans have been wanting to see for quite some time now. This will be a clash of styles with Mysterio's high flying offence being a perfect foil for Bryan's technical style. His new heel persona has been one of the best things in the WWE and his promos being the highlight of WWE's weekly programming. A heel like Bryan needs to face a blue-eyed babyface like Mysterio on the biggest stage as a match like this what sports-entertainment is all about. Given a chance, Mysterio and Bryan will undoubtedly put on a classic match which the fans will fondly remember for years to come. Mysterio's contribution to the world of professional wrestling is unparalleled and the luchador has been one of the biggest pioneers in the business. Mysterio is more than deserving of one last run at the top and we believe that he is the best challenger for Daniel Bryan and his WWE Championship at WrestleMania 35. Besides, everyone loves Rey, so even the fans wouldn't mind Mysterio put in a high-profile match at The Show of Shows. 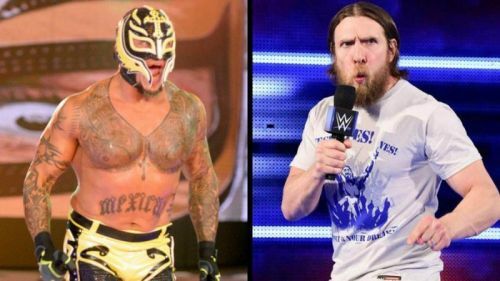 Would you like to see Rey Mysterio versus Daniel Bryan for the WWE Championship at WrestleMania 35? Let us know in the comments below!